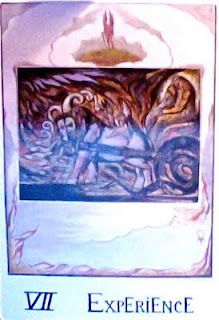 Weekend Reading: Experience (The Chariot) from the William Blake Tarot. Get out and about this weekend. If you've been putting an errand off, this is the time to complete it. In fact, you may feel pulled in many directions, but stay the course. Your efforts will pay off. And be on the lookout for the unusual while you're out there. You're likely to see something that will make a good story.